Comminution '12, the 8th in the series of international comminution symposia, was held at the Vineyard Hotel, Cape Town, from April 17th-20th. The following is not a comprehensive report, so I invite comments from all those who attended, or anyone who didn't but may have views on some of the issues raised. This morning I opened the conference, welcoming the first of our 253 delegates who will be here in Cape Town over the next four days, and representing 30 countries (posting of 17th April). I spoke of the quiet revolution that took place in comminution during the latter part of the 20th century and this was taken up by our first keynote speaker, Chris Rule of Anglo Platinum, who discussed how a typical PGM concentrator might look in 2020, with feed grades declining and the mineralogy becoming more complex and difficult. I asked a general question on whether rod and ball mills will play a significant, or any, role in future comminution circuits. Chris felt that rod mills will play an insignificant role, as they are severely limited in terms of size, and ball mills may play a diminishing role as the upper feed size range of stirred mills increases. 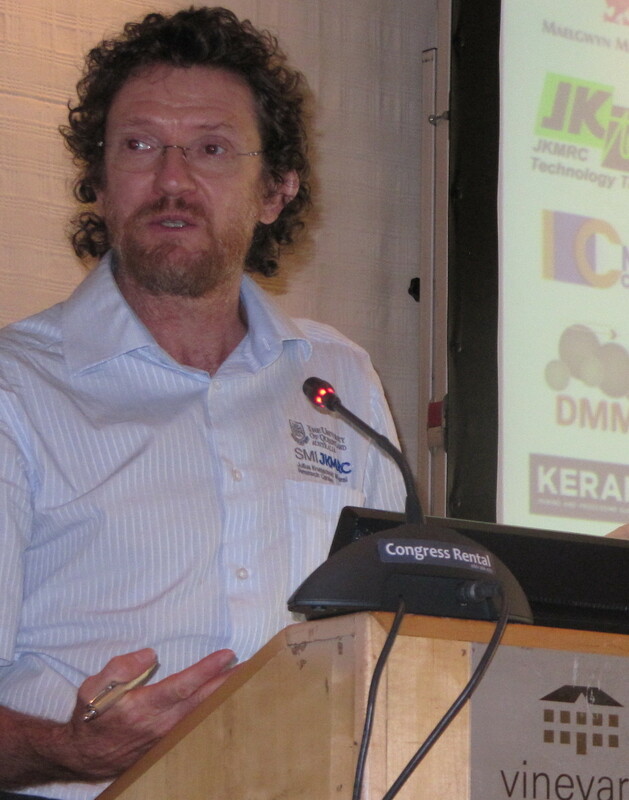 MEI Consultant Malcolm Powell, of Australia's JKMRC, presented an overview of how the newly formed Global Comminution Collaborative (GCC) is addressing future design needs and challenges. The drivers and needs of the industry are evolving, so our tools and capabilities need to advance to adequately address these. New drivers that require a considerable step change to meet the new challenges facing our industry include: energy -­ the mining industtry is being targeted as an excessive user of energy; water - the limitation in production due to a shortage of availability; massive low grade ore bodies ­ the dropping ore grades lead to vastly increased tonnages and treeatment of waste and thus processing costs; increasing demand for natural resources ­ driving up the total energy and water usage within the miniing sector. 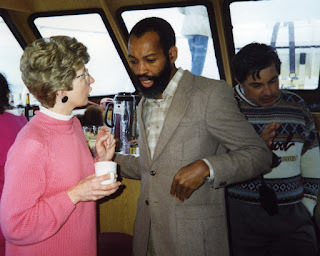 One of the things that Malcolm emphasised is that collaboration is essential these days for effective research and development (see also posting of 29th March). The GCC, for instance, is a collaborative research effort between the JKMRC, Chalmers University, Sweden, the University of Cape Town, Haceteppe University, Turkey, and the University of Rio de Janeiro. 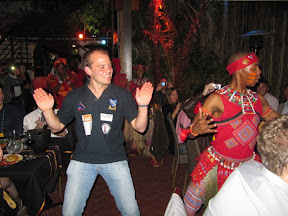 Both Chris and Malcolm pointed out that early rejection of gangue will increase in importance, as a means to reduce energy consumption, and this was emphasised in a paper presented by Grant Ballantyne of the JKMRC. Comminution accounts for approximately 30 -­ 40% of the energy consumed on an average mine site, 4- 9% of Australia's energy and possibly more than 50% additional energy is embodied in steel grinding consumables. Energy savings of up to 50% are theoretically possible by employing novel circuit designs and using smart separation techniques that reject coarse liberated gangue. A range of different strategies such as selective mining, screening, ore sorting, coarse flotation and dielectrophoresis can be used to reject the coarse liberated gangue at different particle sizes. These technological advances have the potential to increase the throughput in the comminution circuit, while decreasing the energy consumed per tonne or ounce of metal produced. As comminution evolves, new methods will be introduced into circuits. High voltage breakage is a novel comminution method that relies on highly energetic electrical pulses to weaken or fully fragment materials. The potential for integration of high voltage breakage into existing processing circuits was discussed by Klaas van der Wielen, based on work on a SELFRAG device at the Camborne School of Mines, UK. These were just some of the 20 papers presented in a very long day. These included work on SAG and autogenous mill design and modelling, dynamic simulation of crushing plants, and the importance of classification in grinding circuits. It's great to see the increasing involvement from China and The Republic of Korea at recent MEI Conferences. The Korean company Cenotec, a major sponsor and exhibitor, has 5 delegates. There are 9 delegates from China, and two Chinese companies, Chemco and Sinoma, are also major sponsors and exhibitors. Another full day commenced this morning with the second keynote lecture, presented by Ted Bearman of Bear Rock Solutions, Australia. His presentation on step change in the context of comminution emphasised some of the points raised by Chris Rule, Malcolm Powell and me yesterday, paricularly regarding rejection of waste material prior to comminution, the evolution of circuits, and the need for collaborative research efforts. Much has been written about innovation and the need for "game-changing" step change. There is no doubt that there are many challenges facing the mining and minerals industry and hence it is appropriate that the industry examines the level of response required. In terms of comminution, the area bears much of the burden for the use of energy in the mining-processing system. Given this specific issue it is reasonable to consider that step change should be targeted at the reduction of the energy input per unit of metal produced. It is important to consider energy in terms of the final output as without this effort could be misdirected. To ensure the maximum effectiveness of innovation in this field, comminution must be regarded as a component of the wider system that encompasses the size reduction from the in-situ rock mass to a saleable product. In regard to the total system, some of the key considerations are philosophical, not technological. Such points include the need to simplify circuits, increase flexibility, examine the impact of variability and consider the end-game. In essence the total system is not about breaking rocks to a size, it is about breaking only what requires size reduction, to the point at which a saleable product can be generated. With this in mind the context for step change is set and formed the basis for Ted's discussion. Ted's paper, and many of the other 15 papers presented today, are available in the conference Proceedings, but I was disappointed that many authors failed to submit their full papers despite many reminders to do so. Today's presentations covered a fairly eclectic field, including closed circuit ball mill basics, real-time grinding control, modelling, vertical shaft impact crushers and roller mills, and the increasing use of HPGR in comminution circuits. The latter included a paper by conference sponsor TOMS of Russia, which described positive and negative experiences in the use of HPGR in gold and copper mines in Russia and Kazakhstan. This paper was interesting not only for its content, but also by the presentation, made in Russian by Arkady Senchenko and simultaneously translated by his interpreter Anna Shevtsova. 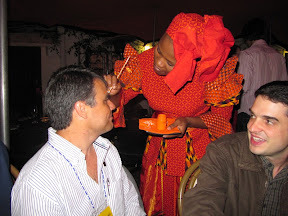 After two very intensive days it was good to get away from the conference atmosphere in the evening, and take the short trip around the mountain to the centre of Cape Town for the conference dinner at the Gold Restaurant. More photos can be found on the posting of 19th April. Despite the copious amount of wine consumed at last night's dinner, there was a very good turnout this morning for a day dominated by ultrafine grinding. the increasing importance of ultrafine grinding is reflected by the number of manufacturers of ceramic beads from around the world who are exhibiting their products at the conference. Attrition mills have been used predominantly for ultrafine and fine grinding applications, but recently more interest has been shown on moving this technology further up the milling circuit to operate as tertiary and secondary mills downstream from the traditional ball mills. The move towards manufacturing much larger stirred mills has enabled the technology to be considered for run of mine processing. For instance the IsaMill has been used commercially in concentrator plants for over 15 years. Improvements in ceramic grinding media, mill design and wear components have advanced the IsaMill to the point where it can readily accept F80s of +300 microns, as discussed in a paper from Xstrata Technology, Australia, and a paper from FLSmidth, Canada, asked the question - is this a threat to traditional tumbling ball mills, or can it been seen as complimentary? A paper from Maelgwyn Mineral Services, UK, introduced a new type of ultrafine grinding mill that incorporates a twin drive mechanism that offers potential savings, and compared the effectiveness of its primary grinding mechanism to two types of current ultrafine grinding mills ­ a single drive horizontal mill and a vertical mill. The single drive horizontal mill relies on high shear near the surface of the impeller disks to obtain particle breakage whilst the vertical mill relies on a combination of the rotational shear and the static head of the media load. The new twin drive mill creates a fixed bed in which the media are subjected to high shear and compressive forces to abrade feed material whilst reclaiming and recycling excess energy from the media mass. The final day, and less intense with only 12 papers, featuring media and liners, modelling using DEM and the use of PEPT to investigate mill conditions. Malcolm Powell finished the morning session by giving a short introduction to the Coalition for Eco-Efficient Comminution (CEEC). This has been set up to bring people together to accelerate implementation of improved processes in comminution, which consumes between 1 and 4% of global electricity, and is increasing as we have to grind finer and finer. As the conference has shown, there is a need for new technology and improved circuits, grinding less by scalping off low value material and optimisation of regrind circuits. Optimising the value chain by means of geometallurgy will increase in importance, the essential objective being to change the grinding conditions continuously as the ore changes. After the final technical presentation, Malcolm summarised the 4 days, and was encouraged to see that industry is now interacting with academic researchers to develop new techniques, collaboration once more being emphasised and is developing as a result of networking at conferences such as this. Ultrafine grinding is becoming more important but it is necessary to prepare material carefully for fine grinding, not merely to tag fine grinding machines to the end of conventional circuits. It is now possible to grind down to 30 nanometres, but how does industry deal with particles of this fine size? 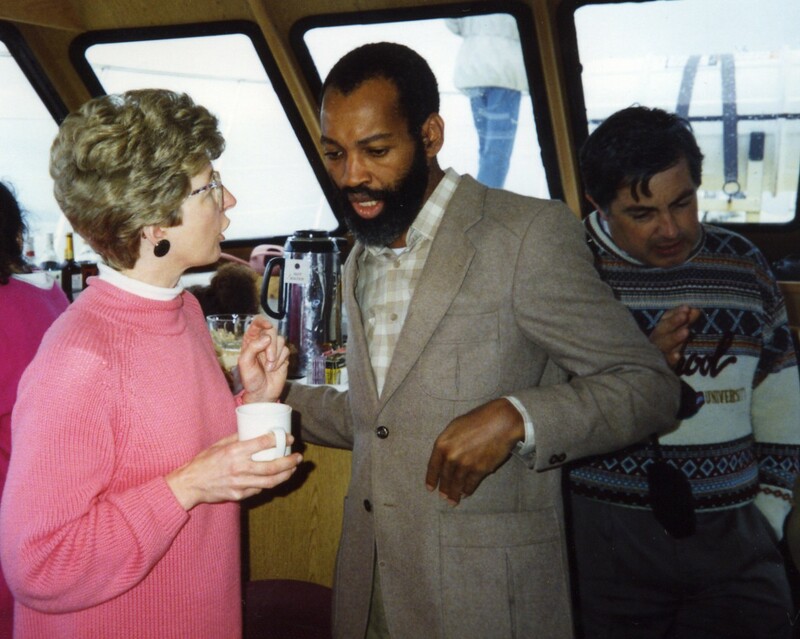 Our other MEI comminution consultant, Aubrey Mainza then discussed the future, and what he would like to see in forthcoming comminution conferences. There are great challenges in energy utilisation and he would like to see examples of process routes which have been used to address these issues. There have been many papers on modelling, and it would be good to see how these models are validated in actual plants, and how control strategies implementing models have been used to improve processes, and how equipment has been designed using DEM, CFD etc. 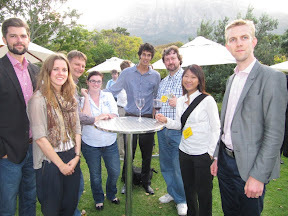 Amanda then closed the meeting, and invited delegates to Comminution '14, which will be held at the same venue from April 7-10, 2014, after which we all adjourned to the sunshine and the Vineyard's magnificent gardens for a few welcome glasses of wine. The Proceedings of the conference is now available on CD, and authors have been invited to submit their final papers to Minerals Engineering for peer review. Those accepted will be published in a special comminution volume and on ScienceDirect. We are now at Johannesburg airport, waiting for our flight back to UK, after a week without WiFi and cell phone reception-bliss! 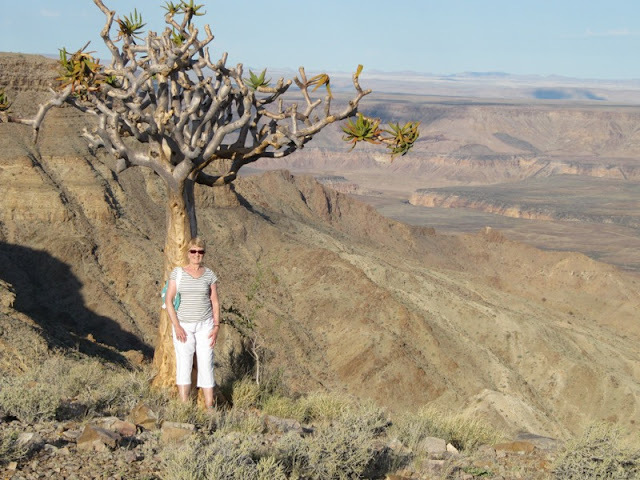 We have been in southern Namibia, and spent four nights at Fish River Lodge, perched directly on the rim of Fish River Canyon, second only to the Grand Canyon in size. A notable difference to the latter was the almost complete lack of tourists in this remote region of Namibia, well away from the more popular northern tourist route. 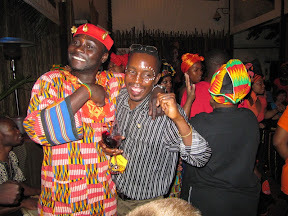 It is also a difficult place to reach, the Lodge being accessible only by car, the last stage being an adventurous 105 km drive along a rough dirt road. In our case, after flying from Cape Town to Upington, we had a 640 km drive to the Canyon. However it was well worth the effort. 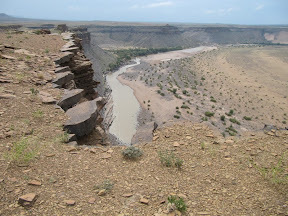 We walked for hours along the southern rim and saw no one as we experienced first hand the effect of the geological forces that unfolded 300 million years ago when the Fish River began to etch its way through hard quartzite forming the Canyon, 90 kilometres long, 549 metres deep and 28 kilometres wide in some places. An added bonus was that, many miles from any town, the unpolluted night sky provided a spectacular view of the Milky Way. 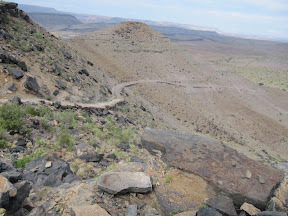 A precarious 4-wheel drive descent into the canyon for lunch by the Fish River was the highlight of the visit. I will be back to work next week and will publish my report on Comminution '12 on Monday, as well as making a start on the backlog of papers submitted to Minerals Engineering over the past two weeks- apologies to recent authors for this delay. 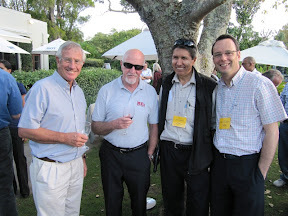 Comminution '12 ended yesterday, and after 4 very full and interesting days it was good to relax at the farewell wine function in the Vineyard gardens. Amanda and Jon leave for the UK tomorrow, and Barbara and I return at the end of next week, after a few days in Namibia. 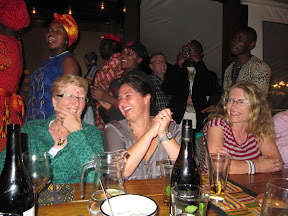 I know many of the delegates are spending a few days in the Cape before returning home, and we would like to publish a few photos showing your activities during and around the conference. Please email directly to me at bwills@min-eng.com. A picture is worth a thousand words, so the six photos below tell it all! 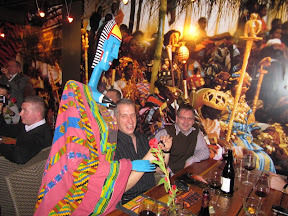 Last night's dinner at the Gold Restaurant in the centre of Cape Town was a truly memorable event, and gave delegates an opportunity to relax and forget breaking rocks for a while. More photos will be on MEI Online in a couple of weeks time. In his keynote lecture yesterday, Chris Rule highlighted the increasing importance of process mineralogy in 21st century concentrators, as ores become more complex and refractory. Our conference consultant Dr. Megan Becker of the University of Cape Town called in today to review progress on the event, which is currently sponsored by FEI, Bruker, FLSmidth and Anglo American. We have two high calibre keynote speakers, Prof. Jan Miller of the University of Utah, and Dr. Wolfgang Baum, of FLSmidth, USA. 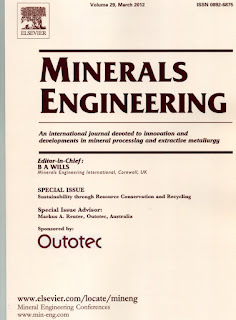 All authors of papers will be invited to submit their final manuscripts for review to Minerals Engineering after the conference for a special Process Mineralogy volume. 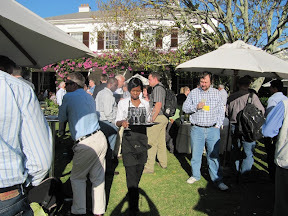 There can be few conference venues as impressive as Cape Town's Vineyard Hotel, in the leafy Claremont suburb. 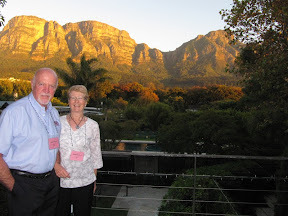 We were up and about early this morning in anticipation of another great day at Comminution '12, with Ted Bearman's keynote lecture to look forward to, and caught this wonderful view of Table Mountain from the conference centre. 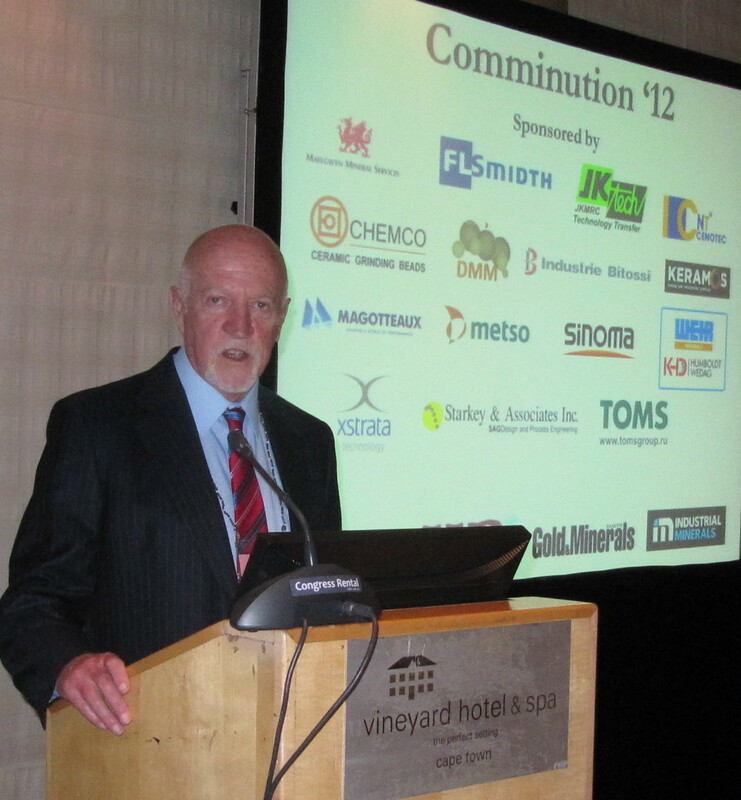 A reminder that my comprehensive report on Comminution '12 will be published at the end of the month. This morning I welcomed around 250 delegates from 30 countries to Comminution ’12. 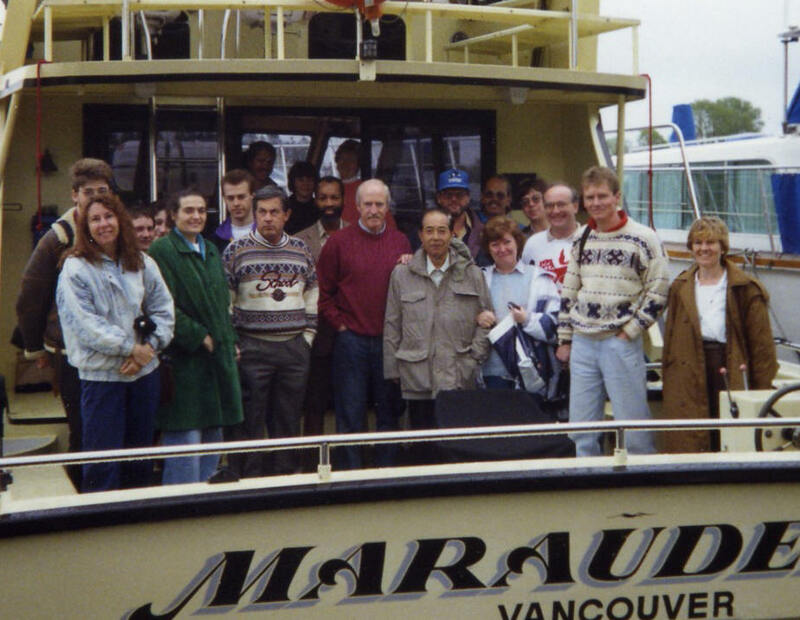 Much has happened in comminution over the past 23 years, since the 1st International Symposium in Cornwall in 1989. 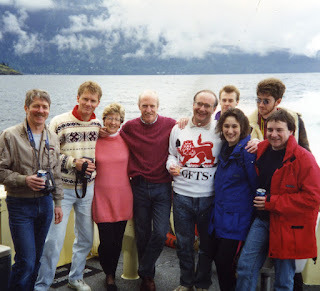 Three years prior to that I was involved with a 2-week NATO Advanced Study Institute, held in Falmouth. The purpose of this meeting was to bring people together to discuss the status and future of mineral processing as ores became ever more complex and refractory. Mineral Processing at a Crossroads looked in depth at new methods which were going to revolutionise mineral processing, such as super-conducting magnetic separation and electrolytic flotation, but comminution hardly had a mention! This was because for most of last century there had been little development in comminution machines and circuits, cone crushing being followed by ball milling, rod mills sometimes acting as tertiary crushers (it is interesting to note that there is no mention of rod mills in this week's programme, suggesting that they might now have gone the way of the stamp mill?). Comminution was well known to be energy intensive and inefficient, but there was little that could be done about it. In the latter part of the century, however, there was a quiet revolution. Autogenous and semi-autogenous milling became more prominent, and then high-pressure grinding rolls began to play an ever increasing role, as did stirred mills, the latter allowing the exploitation of ultra-fine grained ores which had hitherto been impossible to economically treat. This revolution continues, so that comminution circuits today are very much different to those of the mid-20th century with their parallel lines of small ball mill-cyclones. People are still very much aware of the energy consumed in comminution, but are now prepared to really do something about it. 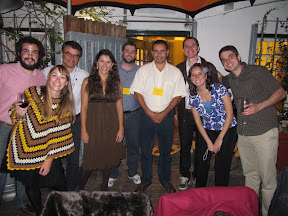 Since the last conference in 2010, the Coalition for Eco-Comminution has been formed, a not-for-profit company. Its mission is to market and raise awareness of relevant research and alternative comminution strategies with the objective of achieving lower process costs and further energy efficiencies in the mining sector. Malcolm Powell will be telling us more about the CEEC later in the week, and in the first keynote lecture this morning Chris Rule of Anglo American Platinum, discussed, via a PGM perspective, how flowsheets might further evolve over the next few years. So it is not surprising that this conference, the 8th in the series of International Comminution Symposia, is the biggest yet. There were 166 delegates two years ago at Comminution ‘10, then the largest turnout in the series. This year we have a record number of sponsors, 18 from all around the globe. 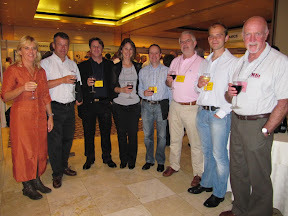 My full report on the conference will be published on the blog at the end of next week. 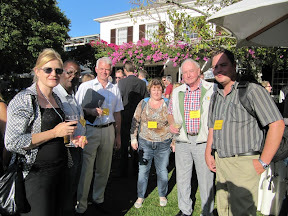 Comminution '12 commences tomorrow morning, and already Cape Town's Vineyard Hotel is full to capacity as the record number of delegates arrives. This afternoon we held the pre-registration wine reception in glorious weather and it was good to see old friends and see many new faces. An exciting week is anticipated! We are en route to Cape Town today, for Comminution '12, but twenty years ago today Minerals Engineering ’92 got underway in Vancouver, Canada. 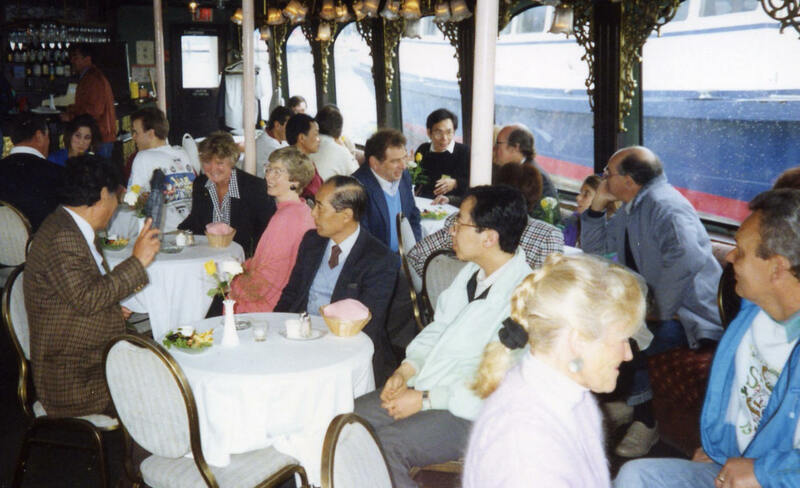 This was the second in the series of Minerals Engineering conferences, which ended in 2002 in Perth, after which MEI focussed on specialist topics. 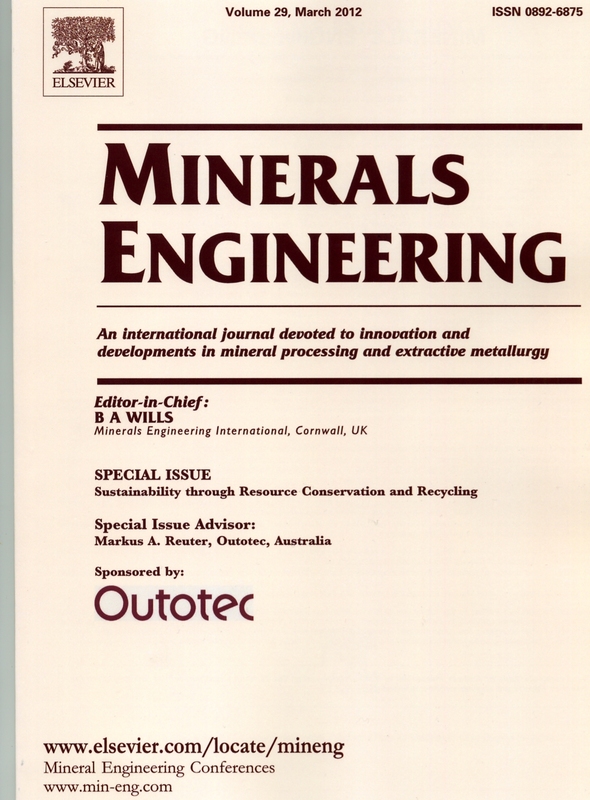 Minerals Engineering ’92 was attended by 52 delegates, and the papers presented are available on ScienceDirect (Minerals Engineering Volume 5, Nos. 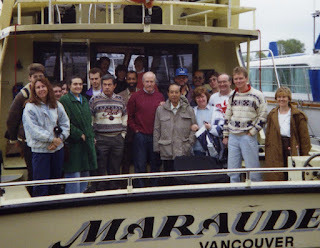 10-12, 1992). 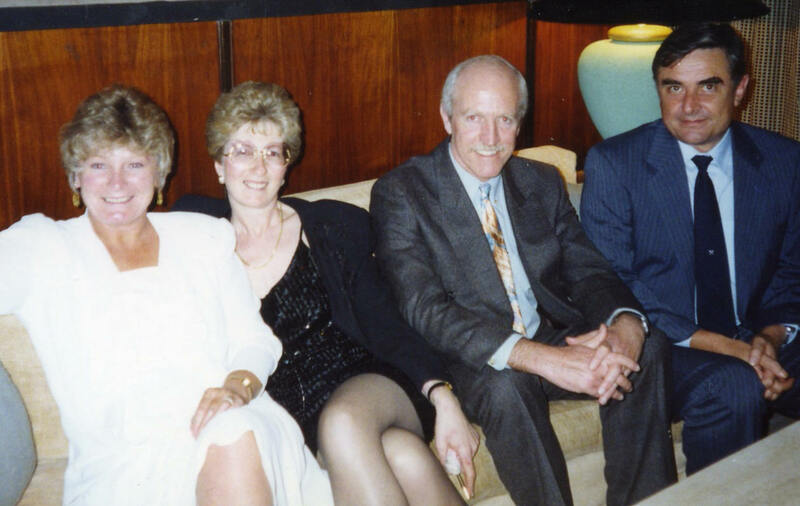 The importance of environmental issues was emerging at that time, and was the subject of the opening address given by me and Keith Atkinson, both then of Camborne School of Mines. We highlighted the fact that it is virtually impossible to predict the future of mineral processing. Computers were being used on many plants for control, optimisation and data processing, but little over 40 years previously one of the world’s leading computer experts had predicted that there could never be a computer industry, as the world would never need more than about 10 computers! We surmised that in the 21st century limitless supplies of energy might be made available by the harnessing of nuclear fusion, which could make mineral processing obsolete, as direct ore smelting, or even direct electrolysis of sea-water for metal recovery, might be economically feasible. 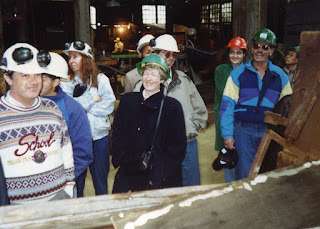 It was a very enjoyable event, which included a boat trip to Squamish to visit the old Britannia copper mine. 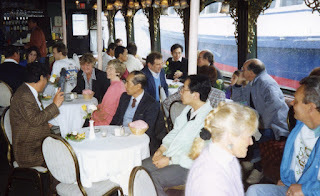 Some of the photographs taken during the 3-days are shown below. 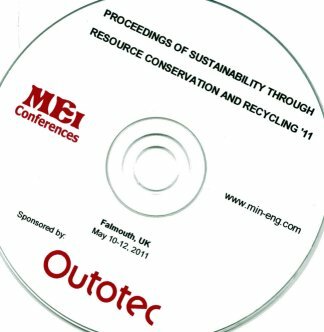 Fifteen of the papers presented at last May’s Sustainability through Resource Conservation and Recycling (SRCR ’11) conference in Falmouth, UK, have now been published in Volume 29 of Minerals Engineering, and the papers are available for downloading from ScienceDirect. The special issue contains a Foreword from MEI Consultant Prof. Markus Reuter, of Outotec, Australia, who also acted as special issue advisor. 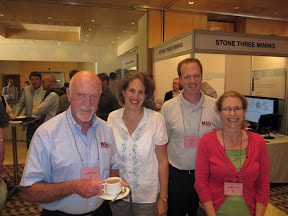 The next SRCR conference, SRCR ‘13, will be held in Falmouth in May 2013, and again will provide speakers with the opportunity of presenting their work to an elite international audience, as well as having the opportunity of publishing the work in the world's leading mineral processing peer-reviewed journal.